First class flight prices may not be going down any time soon, but the value those lucky few in the front are getting for their money just keeps on climbing. While business class passengers enjoy good wines and champagnes, those in first class now enjoy Grand Marque levels served with fine glassware and china, with in flight amenities on the rise too. 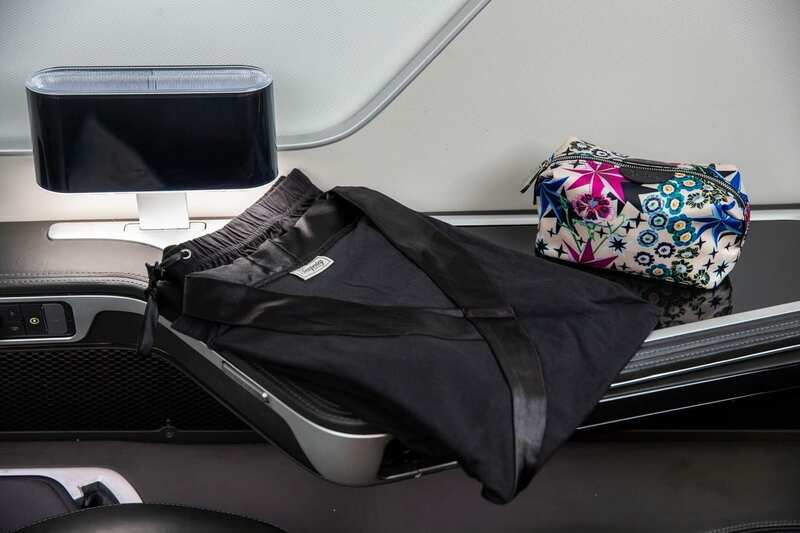 In fact, some first class amenity kits rival the gifting suites at the Grammy’s. They say it’s what’s on the inside that counts, and while the look of British Airways new Temperley amenity kits will definitely catch your eye, the cosmetics and goodies inside may just win your love. Spending £1800 and up for a first class ticket hurts most wallets, but new soft touches and the £100 worth of cosmetics inside these new Temperley amenity kits will definitely help your skin feel better about the whole transaction, thanks to the arsenal of Elemis products. That, and you get a nice pen. As we sifted through the male and female amenity kits launching March 31st on British Airways long haul flights, it was hard not to notice the generously sized “Ultra Smart” range of Elemis Pro Collagen skin care products accompanying the usual range of handy flight items such as a desk quality pen, eye mask, socks and hand wipes. The new kits, designed in partnership with Temperley are a fun new touch with great British design all over the place, including the branded leather “First” logo. Temperley also carved up some new first class PJ’s, and nothing says “I’m in first class” like taking your pants off and going for a sleep. Waaaaw. Thank you for your service.